A team of scientists using highly sensitive radio telescopes has discovered the first complex organic chiral molecule in interstellar space. The molecule, propylene oxide (CH3CHOCH2), was found near the center of our Galaxy in an enormous star-forming cloud of dust and gas known as Sagittarius B2 (Sgr B2). McGuire and Carroll share first authorship on a paper published today in the journal Science. They also are presenting their results at the American Astronomical Society meeting in San Diego, California. Complex organic molecules form in interstellar clouds like Sgr B2 in several ways. The most basic pathway is through gas-phase chemistry, in which particles collide and merge to produce ever more complex molecules. Once organic compounds as large as methanol (CH3OH) are produced, however, this process becomes much less efficient. 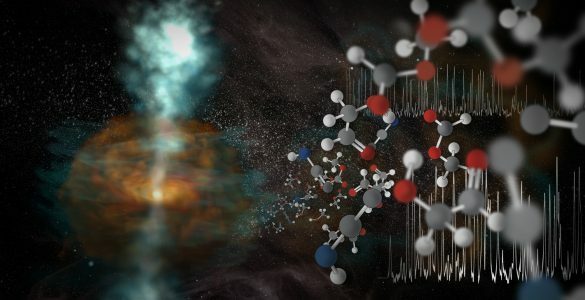 To form more complex molecules, like propylene oxide, astronomers believe thin mantles of ice on dust grains help link small molecules into longer and larger structures. These molecules can then evaporate from the surface of the grains and further react in the gas of the surrounding cloud. 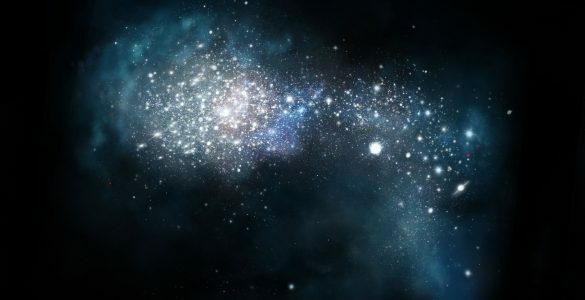 To date, more than 180 molecules have been detected in space. Each molecule, as it naturally tumbles and vibrates in the near vacuum of the interstellar medium, gives off a distinctive signature, a series of telltale spikes that appear in the radio spectrum. Larger and more complex molecules have a correspondingly more complex signature, making them harder to detect. To claim a definitive detection, scientists must observe multiple spectral lines associated with the same molecule. In the case of propylene oxide, the research team detected two such lines with the GBT. 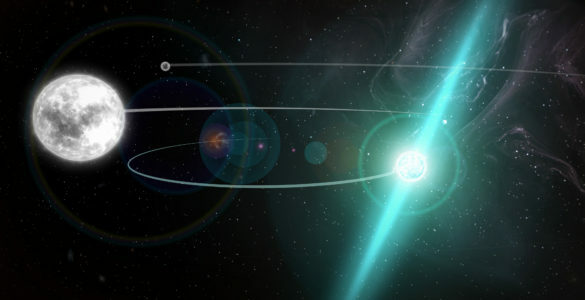 The third was at a frequency difficult to observe from the Northern Hemisphere due to satellite radio interference. Carroll, McGuire, and their colleagues used the Parkes telescope to tease out the final spectral line needed to verify their results. The current data, however, do not distinguish between the left- and right-handed versions of the molecule. In additional to the same chemical composition, chiral molecules have the same melting, boiling, and freezing points, and the same spectra. “These spectra are like your hands’ shadows,” said Carroll. “It’s impossible to tell if a right hand or a left hand is casting the shadow.” This presents a challenge for researchers trying to determine if one version of propylene oxide is more abundant than the other. The researchers believe it may eventually be possible to determine if there is an excess of one handedness of propylene oxide over the other by examining how polarized light interacts with the molecules in space. The 100-meter Green Bank Telescope is the world’s largest fully steerable radio telescope. 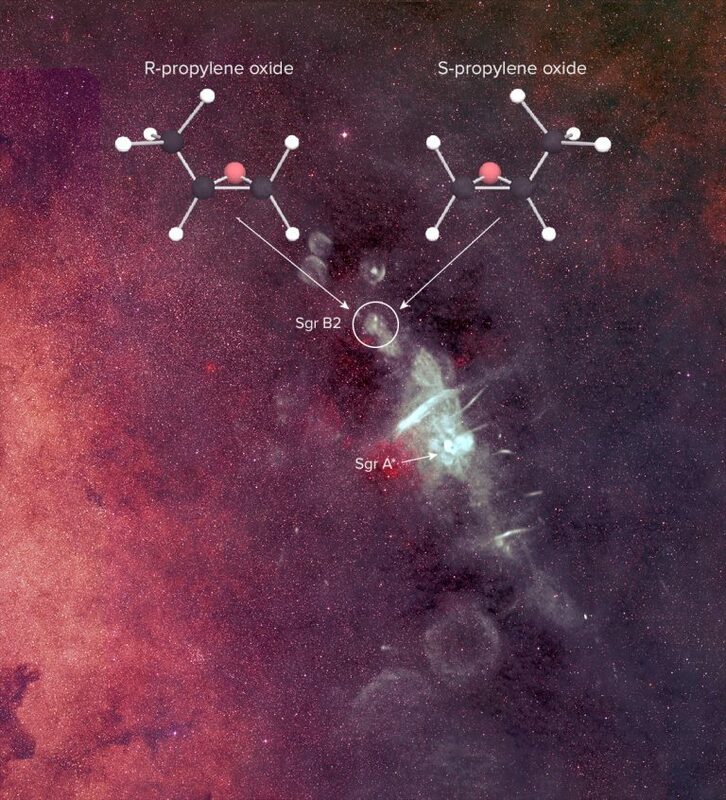 Scientists applaud the first detection of a "handed" molecule, (propylene oxide) in interstellar space. It was detected, primarily with the NSF's Green Bank Telescope, near the center of our Galaxy in Sagittarius (Sgr) B2, a massive star-forming region. 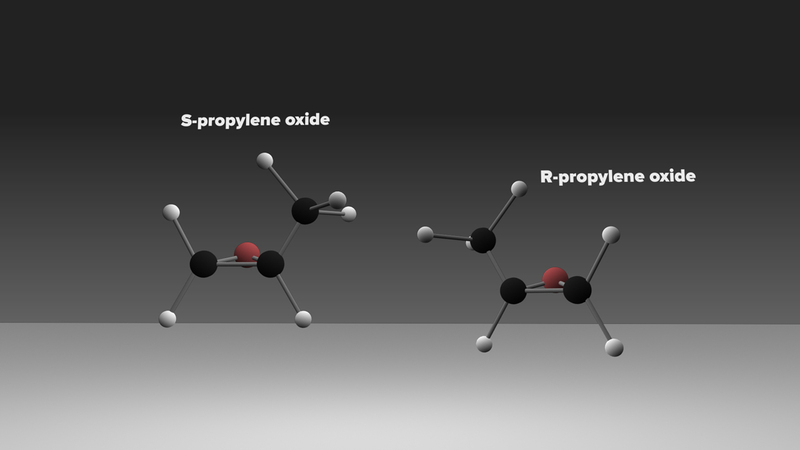 Propylene oxide is one of a class of so-called "chiral" molecules -- molecules that have an identical chemical composition, but right- and left-handed versions. Chiral molecules are essential for life and their discovery in deep space may help scientists understand why life on Earth relies on a certain handedness to perform key biological functions. Sgr A* in this image indicates the supermassive black hole at the center of our Galaxy. The white features in the composite image are the bright radio sources in the center of our Galaxy as seen with the VLA. The background image is from the Sloan Digital Sky Survey. The two "handed" versions of propylene oxide are illustrated. The "R" and "S" designations are for the Latin terms rectus (right) and sinister (left). The S (Latin for sinister, left) and R (Latin for rectus, right) versions of the chiral molecule propylene oxide, which was discovered in a massive star-forming region near the center of our Galaxy. This is the first detection of a chiral molecule in interstellar space. 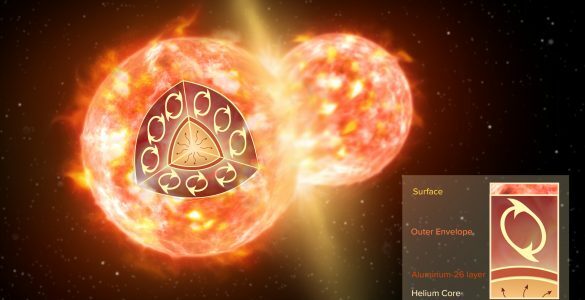 This molecular ballet animation illustrates the left- and right-handed versions of the chiral molecule propylene oxide, which was discovered in a massive star-forming region near the center of our Galaxy. This is the first detection of a chiral molecule in interstellar space.